By: Kelly Devers, Bradford Gray et. Al. 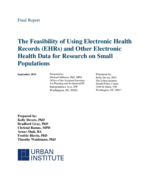 This report was prepared by the Urban Institute under contract HHSP23320095654WC to the Assistant Secretary for Planning and Evaluation. The findings and conclusions of this report are those of the authors and do not necessarily represent the views of ASPE or HHS. Background. Many small populations have distinctive health and health care needs but have been difficult to study in survey research. Objective. This report is part of a project funded by the Assistant Secretary for Planning and Evaluation to explore the feasibility of using electronic health record (EHR) and other electronic health data for research on small populations. The first part of the report illustrates the challenges and limitations of using existing federal surveys and federal claims databases for studying small populations. The second part explores the potential of the increasingly available EHR and other existing electronic health data to complement federal data sources, as well as potential next steps to demonstrate and improve the feasibility of using EHRs for research on small populations. Methods. We use four example small populations throughout the report to illustrate a range of health and health care needs and considerations for research: Asian subpopulations; lesbian, gay, bisexual, and transgender populations; rural populations; and adolescents with autism spectrum disorders. We conducted interviews with experts on the health, health care and research needs for these small populations, as well as with experts on current efforts to use EHR and other electronic health data for research. Findings are based on these interviews, literature, and feedback from a technical expert panel. Results. Challenges to studying small populations using federal survey data include their small size, uneven distribution, and lack of standardized ways to identify population members. The growing availability of EHR and other existing health information has the potential to help overcome some of these challenges, given a number of conditions are met to be able to use these data for research. These include technical, legal, and organizational conditions that each come with their own challenges. However, these challenges are being addressed by researchers around the country who have begun to use EHR and other electronic health data for research on small populations, particularly from organized delivery systems and research networks. Potential next steps may include improving data quality through validation studies and clinician engagement, development of research methods using a combination of data sources, efforts to improve the legal framework under which this type of research is regulated, and pilot studies on specific small populations. Conclusions. There is great potential for using EHR and other existing electronic health data to study small populations. As with federal survey data, EHR data may be better suited for some types of research than others, and the context within which the data was collected must be kept in mind. Secondary use of existing electronic health data is challenging traditional views of research methods, privacy, and research collaboration. To further tap the potential use of these data for research on small populations, the Department of Health and Human Services could work with stakeholders to identify and prioritize key next steps and the potential role that public and/or private funders can play.